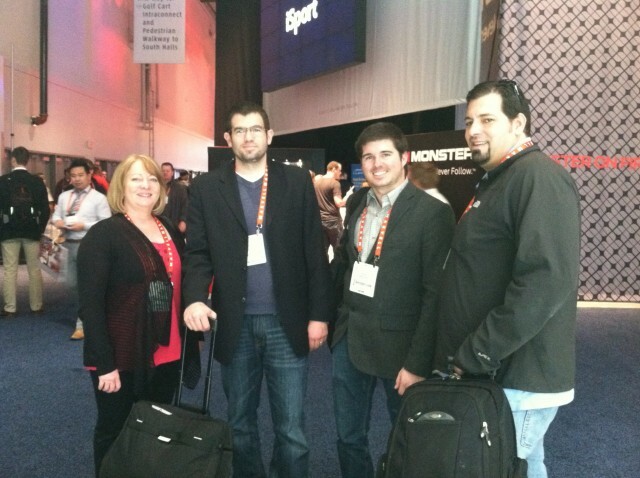 Home / QuiBids goes to Vegas for CES 2013! Every January since 1967 retailers, journalists, and everybody who’s anybody in the electronics industry has met up in Las Vegas for one of the world’s biggest trade shows, International CES (or Consumer Electronics Show). They head out to the desert to get a preview of the next round of must-have consumer electronics, hammer out business partnerships, and even just sort of stand in awe of it all, as each year draws hundreds of thousands of registered attendants. Electronics of course being some of the most sought-after items on our site, QuiBids dispatched a devastating duo of merchandising staffers to Vegas last year, and doubled that number for the 2013 convention last week. Our vice president of business development Kerry Morris joined three of our merchandisers this year —Kevin Elliott, Grant Harland, and Mark Moderie (that’s them pictured up there at the top of the blog post)— and after 44 meetings, the QuiBids crew returned to our Oklahoma City office with big ideas in tow. Here’s what they took away from this year’s CES! What products did you see at CES that you’d most like to bring to QuiBids? Kevin: OLED Televisions. An OLED TV is basically an extremely thin TV that has individual color control in all of its two million-plus pixels. This means that the accuracy of whatever you are viewing (movies, sports, etc.) is going to be fantastic and very lifelike. The pixel will also be able to go completely off, whereas in traditional LED/LCD TVs, there’s always a backlight on. This means that the black levels are great and if you’re watching a movie with many dark scenes (Harry Potter, for instance), it will look fantastic. LG and Sony are coming to the market with OLEDs now, and while they’re still pretty spendy (a 47″ runs around $10,000), they’re the best picture I’ve ever seen. Mark: The tablet created for a PC Gamer, the Razer Tablet. Most tablets are optimized for flash-based games but this is the first tablet manufacturer to incorporate i5 and i7 processors with very large graphics cards and an optical drive that can take a PC game, truly a must-have for the PC gamer. It starts at $999 and I believe it will open a new market within the tablet space. Grant: The Samsung UN85S9 is an 85″ 4k LED TV and it was a sight for sore eyes. This TV isn’t made to sit on a media console or hang on the wall. Instead it sits on a support structure resembling an easel with two woofers, two tweeters, and two mid-range speakers, all powered by a 120-watt amplifier built into the stand. Samsung is to come out with 60″, 65″, 75″ versions this year, all sitting on the same stand. Beyond that, Samsung went all-out having Bill Clinton as their keynote speaker. Another interesting product was the Sony Xperia Z cell phone, which is the first fully waterproof smart phone and also boasts a quad core Qualcomm processor. What’s one general industry trend you took away from CES this year? Kevin: “Smart” everything. Big manufacturers like LG, Samsung, and Sony are trying to make their products function in so many unique ways. From a TV whose controls can be guided by eye movement to very accurate voice control, there is some awesome smart stuff that we’ll see on the market shortly. Mark: It has to be smart technology, like Kevin said. I think the thing that most impressed me was LG’s Google’s TVs equipped with voice-prompted Google and menu searches. You could say stuff like “Action movie with Bruce Willis,” and it would not only bring in content through your subscriber’s menu system, but it’d also pull data from services like Netflix, Hulu, and Amazon video on-demand. Any new products or brands that QuiBids customers can look forward to in 2013? Mark: We had a lot of meetings over the course of the three days we were there and almost all of them, the brands were very receptive to our model. I believe there will be quite an assortment added as a result of the show so keep your eye out QuiBidders, good things to come. Grant: QuiBids Canada will be seeing a whole new array of audio products this year, including products from Klipsch, Harman, and Polk that weren’t previously available. CES has a history of bizarre publicity stunts. Did you guys see anything weird out there? Kevin: Most ridiculous and over-the-top was probably Tablet Man. Mark: The jump-ropers in the Klipsch booth were demonstrating that their new headphones will stay in place during activity and movement. 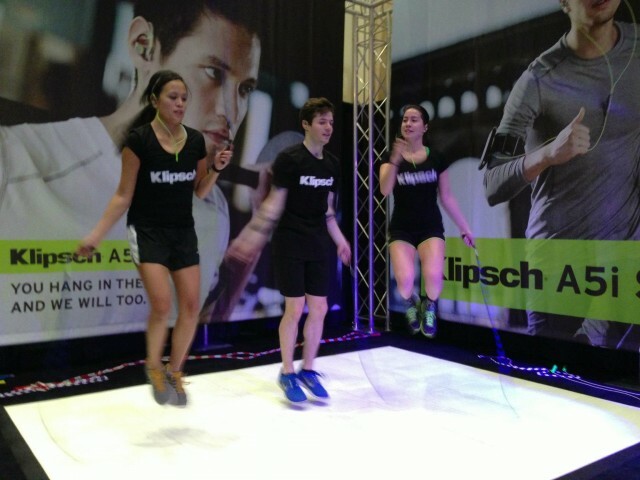 Jump rope photo via Klipsch’s Facebook page.